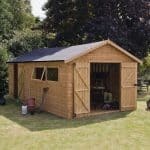 This is an ideal timber building for people who want a durable, yet attractive, and spacious place to carry out their leisure activities or even to act as the base for a small business. There’s lots of room to store equipment or to use for workshop facilities, and this is considerably enhanced by the very tall eaves height. As well as this, there’s a very useful logstore attached, which gives three feet of extra space adjacent to the main building. The logstore area is protected by the extending apex roof and, covered by strong mineral felt, it’s very effective at keeping water out of the workshop itself. 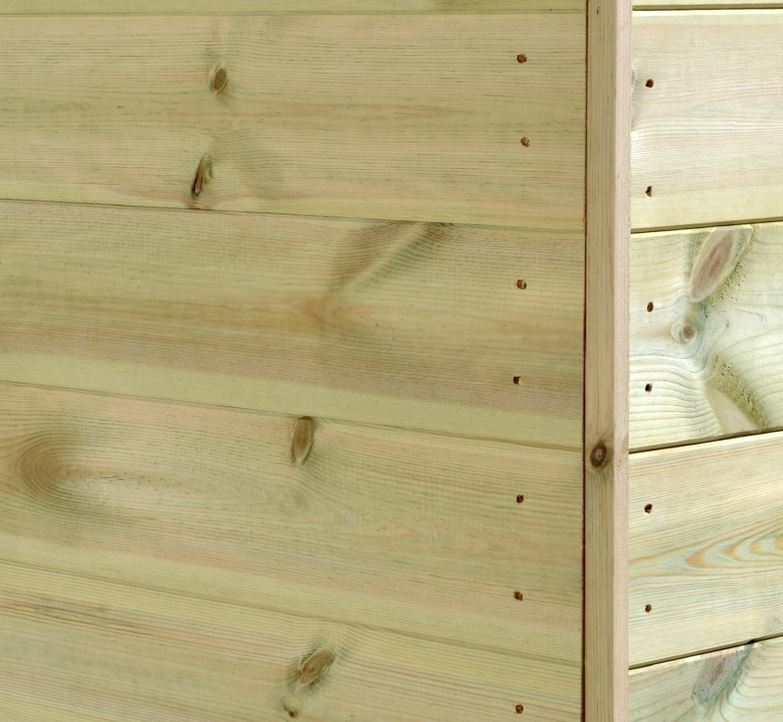 This most essential of functions is also carried out by the tough tongue and groove cladding. It locks together very tightly, so there’s no chance of water being able to penetrate. It’s also pressure treated, which is why a generous 15 year warranty can be provided. We liked the wide and very accommodating double doors, making it easy to move tools and machinery in and out, and we also liked the fact that they’re secured with a key operated lock. With two windows as well, the interior is a safe and pleasant environment to spend time in. The first thing that impressed us about this good looking and versatile apex roofed timber workshop was its size. 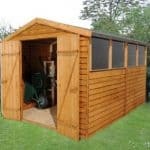 The additional logstore area projects out for three feet from the workshop itself, and can be used for much more than logs. 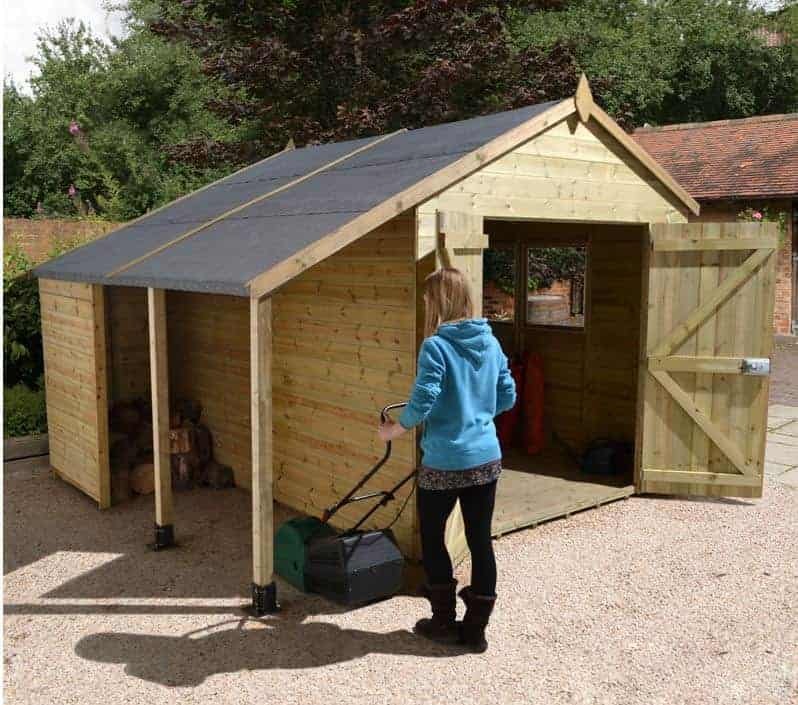 Protected by the roof across its entirety, it’s fully enclosed at the back making it a great place to put topsoil, gardening supplies or inexpensive equipment. 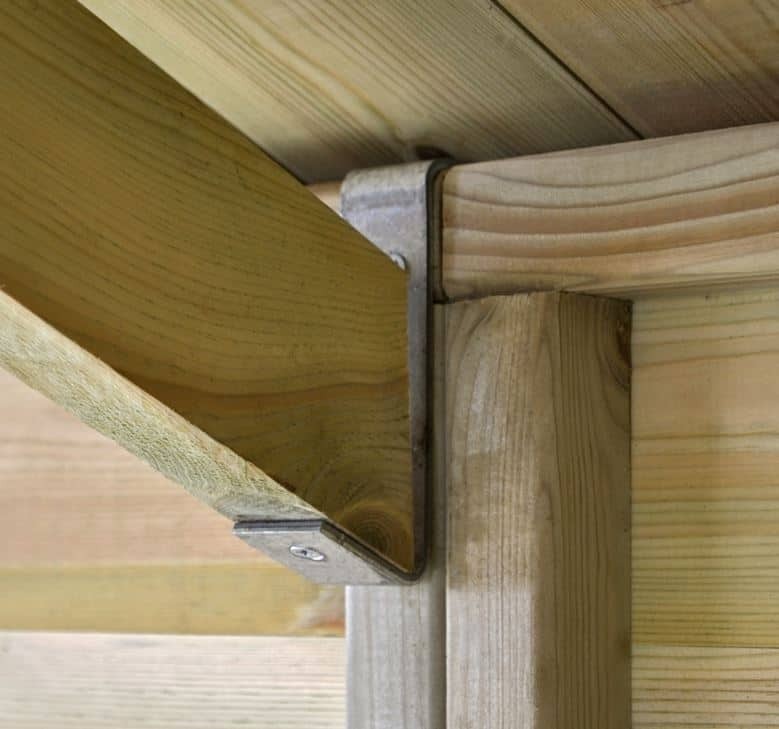 It’s held up by very tough 75 X 75mm support posts, enhancing the strength of the workshop as a whole. 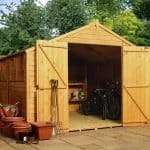 When we mentioned the large size we don’t just mean the width and depth, although at 3.35m (including the logstore) and 3.60m respectively they are very accommodating. 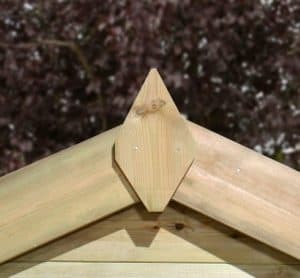 The apex roof gives the workshop a lot of extra space, and its ridge height of 2.54m and eaves height of 1.95m are some of the tallest that we see in timber garden buildings. We were also glad to see that tongue and groove cladding had been used for the roof rather than a cheaper option such as OSM. We were pleased to see that the same tongue and groove cladding used for the roof, where it was covered by roof felt, was also used on the walls and the floor. 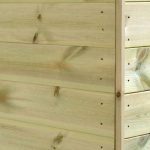 It’s thickness of 12mm is equivalent to that we see on many of the larger sheds and workshops we review, but the frame of 34 X 34mm is slightly thicker than some, giving it a steady and stable feel when assembled. The 12mm thick floor should be suitable for most purposes, although you may want to reinforce it if you plan on having heavy machinery, or maybe even a motorbike or two, inside. What was very good to see was the integrated and pressure treated floor joists. 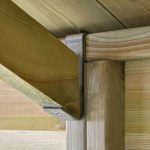 It’s essential to keep the floor of a timber building away from the moisture found at ground level; that’s exactly what these joists do, although it’s not something that we see on all workshops we review. When you spend this much on a workshop you want to know that it will last, which is why we were glad to see that a 15 year manufacturer’s warranty against rot had been provided. The reason that such a long warranty can be given is not only because the roof and cladding are very good at repelling water, it’s also because all of the cladding has been subjected to pressure treatment. It’s a highly effective method of keeping wet rot away, and also means that there is no stipulation that the owner has to retreat it themselves on an annual basis, as there is with many workshops. We would still recommend that you take a look at the cladding every year, however, and apply preserver if needed. The double doors were one of our stand out features. Not only are they strong, they’re also much bigger than those we’re used to seeing. With a width of 1.52m and a height of 1.80m it’s very easy to manoeuvre items of any shape and size in and out, which we always feel is an essential element for a workshop. There are two windows incorporate into the shed, and we liked the way that they make the interior bright and cheery. Because they are fully opening, they can also be used to provide quick and easy ventilation thus helping to prevent any condensation build up if machinery is being used. We were also impressed at the toughened glazing used, a neat extra touch of quality. Security is especially important for a large workshop such as this which is likely to hold valuable equipment and machinery. Thankfully, the manufacturers have thought of this by including a tough key operated lock. 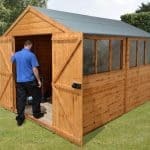 It was a feature we very much welcomed, as even at this price we find that some sheds and workshops don’t include a high quality locking system as standard. 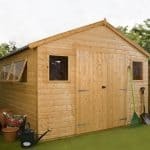 A slatted roof can be added to the workshop, although this does cost £499.99 and we don’t feel that it’s really necessary as we were impressed by the standard roof. One option that we do think represents good value for money is the optional installation service. 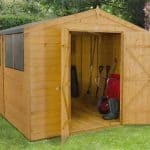 Priced at £189, it means that you can sit back and relax and yet be assured of a perfect looking shed in a quick time. One final extra available at the time of purchase is a tough looking workbench, giving the perfect finishing touch to your purchase. Every component fits together well, and great attention has been paid to the quality as shown by the use of joinery made windows with toughened glazing. Fifteen years is a long time for a warranty to run, but thanks to the high quality and pressure treated cladding we have every confidence that this workshop can last for even longer without rot appearing. 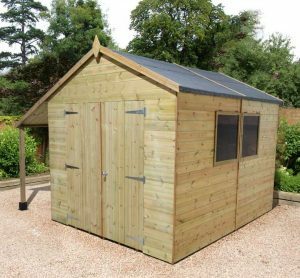 The workshop itself is well dimensioned, but it was good to see that extra space was available thanks to the tall eaves height and the extra logstore area. It has to be said that the complexity and size of this building can make it time consuming to install, so with a friend’s help expect to take up to a day unless you use the professional assembly service. There was a lot to like about this workshop, so even at this price we feel it represents good value for money, particularly as it comes with such a long warranty period. Final Thoughts: Having a high quality workshop with lean to such as this can really transform your garden. It’s so sizeable that it could even be used as a building in which to carry out a job such as carpentry, mechanical repairs or craftwork. With more and more people opting for a self employed lifestyle like that, we can see this workshop becoming very popular. We were pleased to find the doors so wide and tall, as that prevents any difficulties getting things in and out. 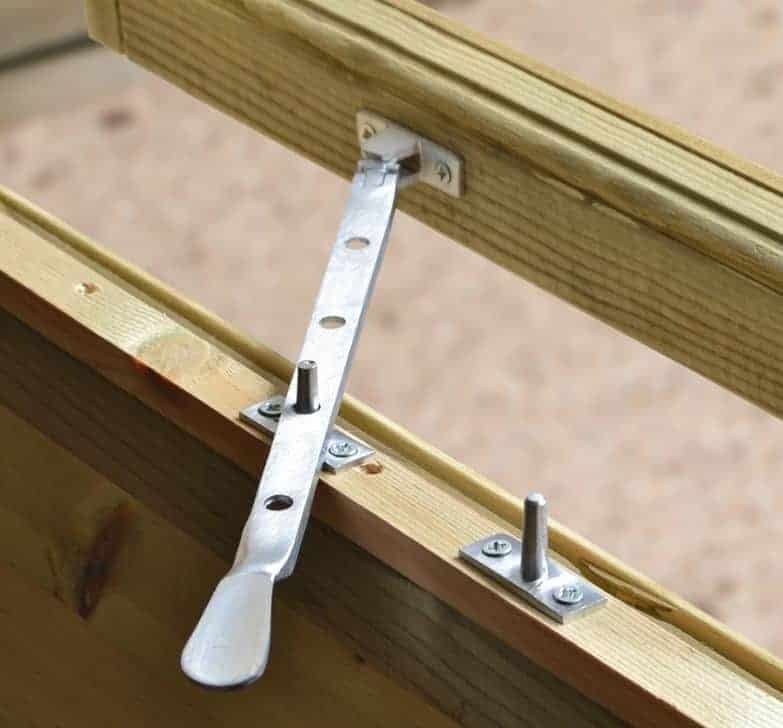 For that reason, it could easily be used to store bicycles or motorbikes, and they’ll be protected against the weather, thanks to the roof and cladding, and opportune thieves thanks to the integral lock.